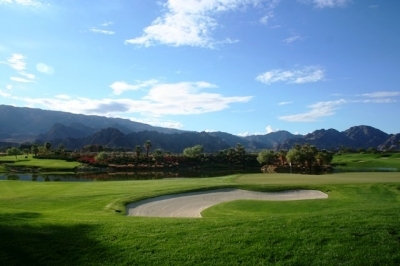 LA QUINTA, CA – It’s a question I often ask golf architects, to describe their first impressions of the land that eventually becomes one of their course designs – and their answers are usually telling, if not descriptive. 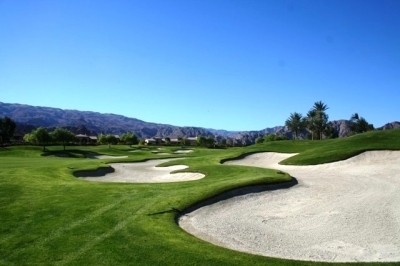 “Flat,” replied Keith Evans, Rees Jones’ Senior Project Architect at Andalusia Country Club in La Quinta, California – when queried on the nature of the formerly untouched desert landscape that has now blossomed into one of the most beautiful golf communities in the greater Palm Springs area. There are 'only' 88 sand bunkers at Andalusia, but they're large and definitely force you to think on every shot. Here, the par four 1st hole. We can forgive Evans for his somewhat unspectacular first impression of Andalusia’s property, because the Jones folks along with a helpful ownership group have literally transported members and guests from the mundane sands of desert southern California to the Andalusia region of southern Spain, complete with Spanish-style architecture, landscaping and vegetation – even offering a plethora of olive trees to give the place a distinct Iberian flavor. And the property’s no longer flat, either – quite a contrast is revealed in the ‘before’ and ‘after’ photos, all things considered. The community’s elevation changes certainly aren’t as dramatic as you’d see in hilly country, but this is hardly a level environment. Looking towards the green of the par five 15th hole - it's easy to see why so many enjoy the golf lifestyle of the California low desert. Andalusia’s story begins with its developer, Drummond Real Estate (Grady Sparks is the former President of the company), ends at present with a completed Rees Jones golf course and includes a trip to Spain mixed in along the way. 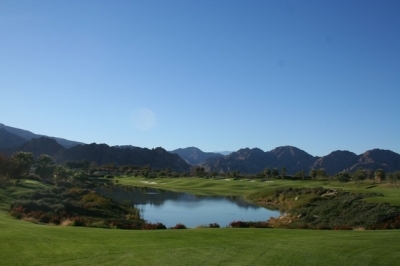 Drummond has been involved in the La Quinta area since 1993, and once its first community (Rancho La Quinta) was nearing completion in the early 2000’s, it was time to look for another site for a possible project. 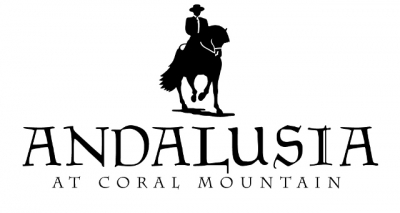 Moving forward to 2003, the company acquired 1000 acres of land with the intention of building Andalusia at Coral Mountain, a community to be influenced by the Andalusia region of southern Spain. Sparks and other members of the development team even traveled to Spain in the beginning to soak in the ‘flavor’ of the region -- and as of 2010 they’re well on their way to the eventual goal of offering members two Rees Jones designed golf courses (the second course is in the plans but has not been started yet) in addition to a host of amenities that you’d expect from the finest of private clubs. The history of the California low desert also deserves note, as the harsh natural environment wouldn’t easily lend itself to human habitation. 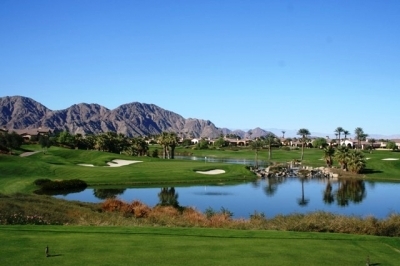 The entire low desert area is known to locals as the Coachella Valley, which also encompasses the nearby communities of Palm Springs, Palm Desert, La Quinta and Indio, amongst others. The par three 2nd hole is the first of a terrific Rees Jones-inspired set of par threes at Andalusia. The valley’s floor was once under water (as recently as 400 years ago), the site of a huge sea created by the flooding of the Colorado River – and the ancient water level can still be seen against the rocks on the nearby mountainside. As testimony to the land’s previous ‘aquatic’ nature, remnants of seashells (both salt and fresh water) are plentiful in the region. The Coachella Valley was also home to the Cahuilla Indian tribe in times long ago – who took advantage of the land’s (and lake’s) gifts to make their homes and establish a thriving civilization. 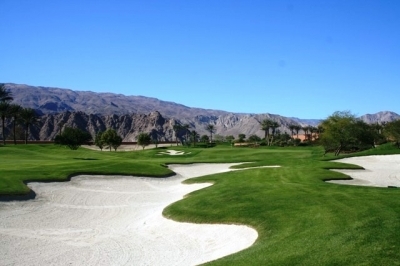 Archeological evidence of the Cahuilla presence is still being discovered and analyzed – it appears as though contemporary residents and golfers aren’t the first ones to see the area as a pleasant place to live. American discovery and exploitation of the region began in the early 1850’s with the expedition of geologist and geographer William P. Blake, who painted quite a different picture of the surroundings in his journal than you see today – he basically called it uninhabitable. Rees Jones always suggests the best shot to hit with his hole designs - and on the par three 14th hole, he strongly hints you should hit the green. As for Rees Jones’s involvement at Andalusia, Evans says it was the result of mutual interest in the work. 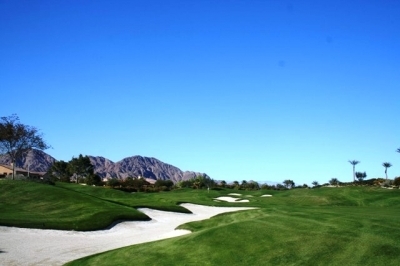 “Grady Sparks was familiar with our golf courses and gave us a call, telling us of a new community that was going to be built in the La Quinta area, and offering a chance to design the golf component,” Evans remembered. “Rees was particularly interested in the Coachella Valley region because we hadn’t previously done any work in the area, but wanted to. After several conversations with Sparks and the owners, he thought this was the project that really seemed to fit. He’d turned down a couple other potential sites out there – but this was one that finally seemed right.” Evans said. As noted above, the Andalusia property’s pristine topography wasn’t necessarily the draw – it was the chance to work in a region that’s increasingly well known for its quality and quantity of golf. And the ‘flat’ site wasn’t necessarily a drawback, either. The par four 6th hole plays to an elevated green with a large bunker protecting the short approach - and the sloped green's a tough one, too. Jones is a master at doing that – you don’t get hired to renovate and restore a good share of the recent U.S. Open (and PGA Championship) venues by luck alone. Jones’ ‘Open Doctor’ nickname is particularly appropriate for his ability to design tough tests of golf for the best players on the planet, but he’s also known for laying out playable courses for all abilities. Andalusia's par four 17th hole - picture postcard perfect. From the landing areas into the greens, Jones presents a picture of the test in front of you – where the trouble is, and how a precise shot might help you avoid it. All of the above is in evidence at Andalusia. The playing surfaces and landing areas are extremely generous – some might call it ‘forgiving,’ but the larger the miss into the cup location, the more daunting the short-game task you’ll face. 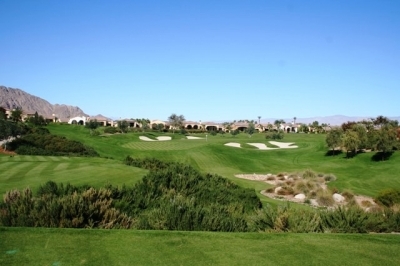 The par four 8th hole leads you back towards the mountains, and the hole's fairway bunkers help point the way. Andalusia’s playing corridors are also quite wide – and contrary to the stereotype of a residential golf course, on most holes, the houses aren’t even within reach. Evans said the ownership wanted a course with two-hole corridors, meaning there’ll only be residences on one side of the golf holes – which spares the players and the residents alike. The course stretches to over 7500 yards from the back tees, which Evans says was due to the ownership’s desire to build a layout that could challenge the best players in the game. Though the course is not slated to hold any Tour-level events at present, it certainly could handle one if that were a direction the club would choose to go. From behind the green of the par three 12th hole. 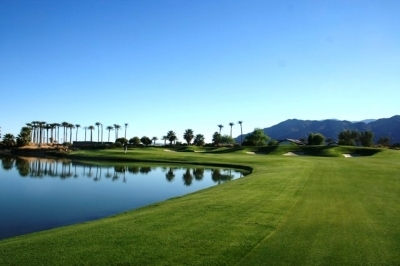 The layout’s wide playing surfaces make for an enjoyable round without losing a lot of golf balls – the club used 225 acres of sod to define the golf area, so there’s a lot of safety for your wayward shots. Dempster says Andalusia’s main challenges stem from its 88 sand bunkers (which are also pretty large) and its plentiful water features. Evans noted that the ownership group did not favor ‘small’ type ponds, so if there’s water on a hole, it’s usually a significant part of the strategy on the link. A perfect example is the par five fifteenth hole, a risk-reward gem that plays 585-yards from the back tees. The tee shot calls for only a mild water carry, but the second shot provides several options on how to play it – including the ultimate test of a full water carry into the green for those going for it in two, and not to be tried by the timid. If you manage to reach the green on the fifteenth (or any other hole), a large putting surface awaits you – and the greens contours are reasonable at Andalusia. You may very well end up with some lengthy putts on these greens, but there’s nothing tricky about them, and they’re in terrific condition as well. The daunting par four 4th hole is a tough test from tee to green. 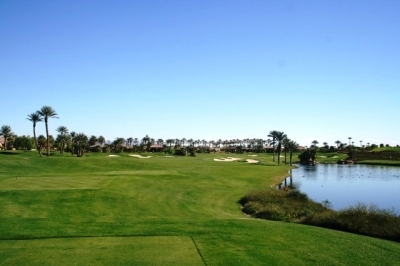 Other hole highlights include the par four fourth, Andalusia’s number one handicap hole. Measuring 487-yards from the back tees, it’ll take all your length and finesse to approach par on this hole. 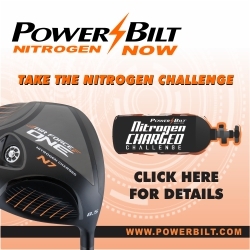 Water guards the entire right side of the hole, but would only catch a badly pushed ball on the tee shot. 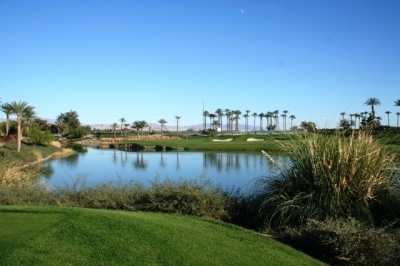 The water creeps in towards the green and will definitely challenge you to get it close if the pin’s on the right side. The par three seventh hole is the front side’s ‘signature’ hole, and demonstrates the topographical movement at Andalusia that was built in by Rees Jones, as the tee shot plays slightly downhill. There’s an attractive waterfall to the right of the green complex, and the green itself is on a wide peninsula – this is one you’ll definitely remember. Moving to the back, the par three twelfth hole is another one-shot Rees Jones classic, playing 222-yards from the back tees with a full water carry. The green looks tiny from the tee but actually presents a good-sized target – don’t go long, however, or you’ll find bunkers waiting to grab your wayward shot. The par five 15th hole has all the risk-reward qualities that a golf hole should have - it's a fairly easy par if you play it safe, but a tough birdie if you don't want to go for it. 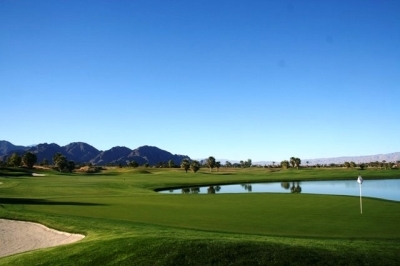 The par four seventeenth hole synopsizes everything that is Andalusia -- namely a beautiful mountain backdrop, a challenging but fair golf hole and risk-reward options from the tee and second shots. Many a club match will be determined right here, with bragging rights included. Andalusia certainly does stand out, as a Spanish oasis in the California low desert, just waiting for a ‘discovery’ all its own. Looking from the tee of the par three 7th hole, it's hard to believe that Andalusia's land was once flat and featureless. The Rees Jones golf course is certainly a focal point at Andalusia, though there’s quite a bit to offer folks in the community, even if they don’t play golf. At 617-yards, the par five 18th hole is Andalusia's longest - one last challenge to overcome on your golf round. Homeownership at Andalusia at Coral Mountain includes access to Andalusia’s world-class Racquet Club & Fitness Center, which features nine lighted tennis courts (three of which are red clay courts), a swimming pool and spa, the latest exercise equipment, superb dining at Tapas Restaurant, and a hiking and biking trail that navigates the inside of the perimiter wall. Golf memberships to the private Rees Jones-designed course are available for a separate fee. 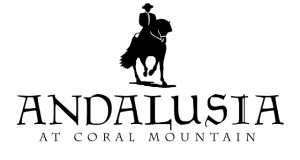 This season, Andalusia is offering a special golf incentive. 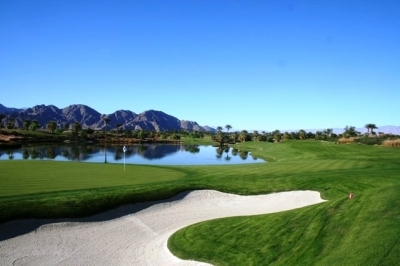 For details, call Kurt Dempster, Director of Golf & Membership at (760) 777-1014.